Heres Charlie hard at work with the planer, carving the Jarrah cross member on one of the frames down so the plywood will fit the bottom in a nice even curve. For those who wonder, its summer here, balmy weather and about 27deg C today, very little wind and the glue kicks off pretty quicly without it being so hot that we melt into a puddle of sweat. Planking proceeds, its repetitive work but the sort of thing I enjoy. Having done it a few times I look for every tiny way of speeding the process up and it’s a lot of fun seeing how many pieces I can add to the boats skin in a day . But watching Charlie, this is new to him and I suspect that hes’ finding it tedious plus is aware that time is ticking by and the departure date for the seasonally appropriate departure from New Zealand into the Southern Ocean is not so many months away and he’s feeling the pressure a little. But I’ve seen a lot slower builders, and he soldiers on, each day sees the project move on and its evident that he is learning a lot as he goes. A shot along the port topsides showing the inner skin of the topsides making progress forwards. 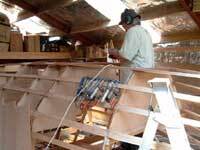 Fairing up the stringers so the skin lies far is a tedious job, and especially around the forefoot a practiced eye will be quicker than a novice so I’ve just been out there helping with the little Bosch power plane. It’s a light weight handyman level job made mostly of plastic and aluminium with only one tungsten carbide blade but its great for this sort of light shaping work. I have covered myself with shavings and wood dust, ( all over the inside of my specs so the world is a bit blurry now) and done the bulk of the fairing up of the stem and forefoot area starboard side. 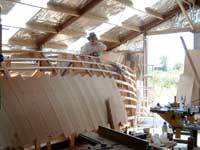 Charlie is busy now tidying this up with the hand tools and will be buttering up planks with epoxy very soon. I’d expect him to be up to the stem on that side very soon, and then he will be working on the chine panel in about two days and I’ll do the other side of the stem when the glue is ready. 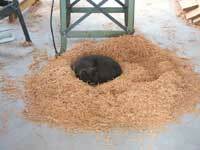 A Cats bed, took ages to make and only the very best wood shavings will do. He only sleeps there until we get the machinery going in the morning and I caught him still in bed this morning. The bottom of the frames are ready to fit the forward section of the bottom panel, like a lot of the boat the bottom is two layers, this time of 9mm ( 3/8in ) plywood and the first layer goes on after the chine panel planking in such as way as to protect the edges of the planking. I can see the second skin not being too far away for beginning, and will have to monitor the use of the epoxy resin so we have some more in before this 30 litre set of WEST runs dry. While all this goes on Warrior Prince Claws McLeod the Grey ( otherwise known as the shop cat ) adapts to his advantage anything that is going on. In planing off the planks to the right thickness and finish there are a lot of nice smelling shavings at the outfeed of the planer, and of course they were made specifically for a cats leisure. Have a look at the pile of shavings in the pic! Designer, and slave to a small furry cat that thinks the world is there for his benefit alone.